Let's get twisted with the freshest new nicotine salt vape juice flavors by TWST E-Liquid. 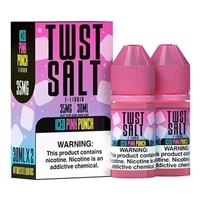 TWST Salt is made by Twist e liquids and known for their delectable Lemon Twist, Melon Twist and Fruit Twist e juices. Now salt nicotine fans can finally enjoy these top selling flavors in a high nicotine e-liquid made especially for pod style e-cig vape devices.You'll want to savor the summer fruit goodness of Honeydew Melon Chew, Pink Punch Lemonade, Watermelon Madness and Iced Pink Punch Lemonade with each and every vape. So flavorful and delicious, you'll be glad they come packaged with two 30ml bottles per box! Try them today!